Interim Motherwell manager Stephen Robinson has spoken about how tricky it’s been for him to replace sacked Mark McGhee in the Fir Park hotseat. Northern Irishman Robinson (42) returned to Motherwell a fortnight ago on the initial proviso that he would help out McGhee – subsequently dismissed by ’Well on Tuesday – until the end of the season. But Robbo – himself sacked as Oldham Athletic manager in January after less than eight months in charge – has now emerged as a forerunner to get the gaffer’s job permanently as he gets set to take charge of ’Well for this Saturday’s crucial league game at Kilmarnock. He said: “Replacing Mark has been very difficult. “In truth I didn’t see it coming. I had agreed to come back until the end of the season and then look at a few options that would come into the mix. “It’s taken everybody by surprise. I spoke to Mark afterwards and I said: ‘They have asked me to take the game on Saturday’. McGhee was sacked after a poor run of four consecutive league defeats, including 7-2 at Aberdeen and 5-1 at home to Dundee on Saturday. 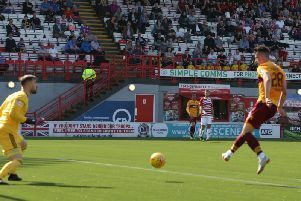 Robinson knows that the Fir Park outfit – now in the relegation play-off position – must arrest that alarming slide quickly if they are to remain in the Scottish Premiership. He said: “We have conceded 27 goals in 10 games. We have won one in 10. “We have to stop conceding goals so we have worked a lot this week on our team shape and team play, putting in some new ideas and ones that we have used previously. “If you don’t do the basics right, winning headers, tackles and second balls and having that desire to win football matches then it doesn’t matter who sits in the hotseat.